With the CBGB movie premiering tonight and the CBGB Festival kicking off this week, nostalgia for the East Village and Lower East Side of yore is ripe as ever. You’ll forgive us for indulging along with everyone else: This Friday, join two consummate chroniclers of downtown music and nightlife at the B+B Newsroom as they read from their recent memoirs and tell it like it really was (no Savannah stage sets here). 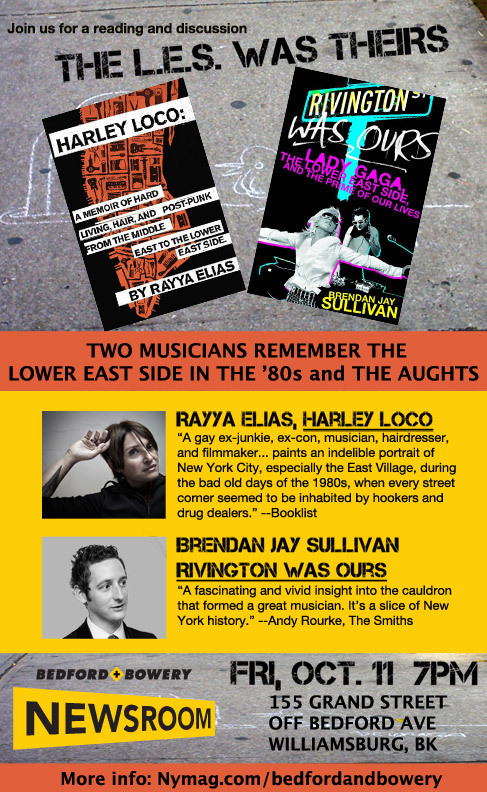 Friday at 7 p.m., both authors will read from their books and remember the Lower East Side in its days of grit and glam. Join us at the Newsroom, at 155 Grand Street, off of Bedford Avenue, in Williamsburg. As usual, the event is free — just let us know you’re coming.